What most people know about the Civil War comes from the textbooks they read in school. Most people probably think that the Civil War began on April 12, 1861 with the attack upon Fort Sumter, and ended with the surrender of Robert E. Lee and his Army of Northern Virginia at Appomattox Courthouse on April 8, 1865. I do not, by any means, claim to be an expert on this era of American History, but I’d be willing to bet I know more about this period of our nation’s history than most people do. In 1815, forty-six years before the first shots of the Civil War were fired, John Adams sat down and wrote a letter to Thomas Jefferson in which he said, “As to the history of the revolution, my ideas may be peculiar, perhaps singular. What do we mean by the Revolution? The war? That was no part of the revolution; it was only an effect and consequence of it. The revolution was in the minds of the people, and this was effected … before a drop of blood was shed.” I feel very much the same about the Civil War; that it was an effect of something much larger; something the origin of which can be traced back to the very first settlers to come to this land we call America. Since so many people are of the belief that the Civil War was fought solely over the issue of slavery, I feel it is my duty to speak on it to a certain extent. Most of those who feel strong anti-Confederacy sentiments do so because of the fact of slavery in the South. Yet their ignorance regarding slavery in America allows them to have their emotions manipulated against the South and their cause. So, while it may, or may not be true that the North fought to end slavery, it is also true that they were probably even more prejudiced against the black man in 1860’s America than their counterparts in the South. Then there is the question of how slavery even got started as an institution in America. Do people think that the settlers to Jamestown or Plymouth brought slaves along with them on their voyages to the New World? Do people think that, once they established their Colony, they took a ship to Africa to capture a few slaves to work their land? The first ship to bring slaves to America came in 1617 where the slaves were sold to the Colony of Jamestown, not by the Dutch as many believe, but by British pirates who had stolen the human cargo from the Portuguese slave ship, the San Juan Bautista. So, it was the British who introduced slavery to America, and until the Colonists developed their own shipping industry, it was the British who continued to bring slaves to America. I’ll bet you also didn’t know that the overwhelming majority of the slaves which found their way to Southern Plantations were brought here by shipping companies owned and operated by Northerners. Fortunes were made by many in the North, with the importation of slaves providing much of their wealth. For instance, I’ll bet you never heard the name James DeWolf. At the time of his death James DeWolf, of Bristol, Rhode Island, was the second richest man in America. And how did he acquire that wealth? It couldn’t possibly have anything to do with his shipping business which just happened to be delivering captured slaves to America…could it? Then there was the Brown family, also from Rhode Island, who from the fortune they made on the slave trade established Rhode Island College, later to be renamed Brown University. Hell, Ezra Styles owned a shipping business which imported slaves while he served as president of Yale University; that bastion of the Ivy League. So the hands of those in the North certainly aren’t clean when it comes to who is responsible for slavery in America. And, since were assigning blame for slavery, let us not forget those fellow Africans who were in the business of rounding up their countrymen and selling them to the slave traders. The Oyo and Ashanti empires routinely captured those of other tribes and sold them to Western slave traders. Oh, by the way the Oyo and Ashanti empires are now the nations of Nigeria and Ghana. So there is plenty of blame to spread around if you want to blame someone for slavery in America. Your anger and resentment over that tragic blot on our history should not be focused solely upon the South; it should also go to those who profited off slavery. To those who say the North holds the moral high ground on the issue of slavery, you might ask yourself the following question: If slavery was such an important issue with them, why did the Northern delegates compromise their beliefs and allow it under the Constitution? As much as slavery was, and is an evil practice, it was Constitutionally legal at the time. While many despise Jefferson simply because he owned slaves, they forget that many Founders, including George Washington, also owned slaves. These same people that condemn Jefferson for being a slave owner do not realize that under Jefferson’s leadership slave importation was banned in Virginia in 1778. He also led an effort to criminalize the international slave trade, and in 1807 signed a bill sent to him by Congress doing just that. Jefferson felt that slavery was a violation of the most fundamental of human rights. Yet he sought to educate and train those serving as slaves so that they could become self-reliant before they were freed. Yet Jefferson also felt that, after over a century of having served as slaves, the lingering resentment between them and us would be so great as to not permit the two races to live peacefully side by side. Jefferson felt that education, and then colonization elsewhere was the best possible solution to the question of what to do with emancipated slaves. I’m not taking either side on the subject of slavery; I only want to show that the South was not the only part of the country responsible for its being an institution in America, and that certain of our Founders had plans for eradicating the practice of slave ownership in America. So the seeds of the Civil War, if you can call them that, and if you believe slavery to be the only reason the war was fought, were laid from the very beginning when the first settlers to America purchased slaves to work their land way back in 1617. But what happened after the South surrendered in 1865 is what I would now like to discuss. After Lee surrendered to Grant at Appomattox Courthouse, the hostilities between the two warring nations died down. Yet the South lay in ruins, with entire segments devastated beyond belief. The entire Shenandoah Valley had been burnt and destroyed by Union General Sheridan, and the area between Atlanta and Savannah was total wreckage after Sherman’s March to the Sea. Estimates vary between 1 to 13 percent of the adult male population of the South perished during the four years of war. Aside from the 3 day battle at Gettysburg, most of the major battles took place on Southern soil; leaving the countryside and the infrastructure devastated. 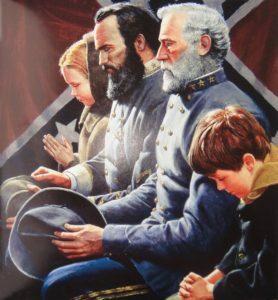 Those who fought for the South, and survived, were to go back to their homes and face the enormous task of restarting their lives. President Andrew Johnson hoped to make the transition back to peace as smooth as possible for the defeated South. Yet there were those in the Republican Party who wanted revenge and sought to humiliate the South; to make them suffer the consequences of their having ’caused’ the Civil War. Prior to the Civil War the US Supreme Court had ruled that even though a slave may have obtained his/her freedom, they were still not considered citizens of the United States. This Dred Scott decision was now a major problem because after the ratification of the 13th Amendment, every slave in America was suddenly free; but without any legal status. The Republicans in the North saw this as an opportunity to rub salt into the wounds of the South by proposing the first Civil Rights Act in America. However, the law was vetoed by President Johnson; raising the ire of Northern Republicans. All the while a 14th Amendment to the Constitution was in the works, which before they were allowed to resume their places in Congress, the South was forced to ratify; a clear case of coercion, or blackmail. One of the major claims of the Lincoln administration was that secession was not constitutionally legal; and therefore the South had never legally left the Union. If this is true, then how come the South was forced to accept the 14th Amendment BEFORE they were allowed to resume their rightful places in Congress? Once the 14th Amendment was ratified, and another election held, the Republicans garnered enough power to overturn President Johnson’s second veto of the Civil Rights Act and it became law. Today the 14th Amendment has been perverted to grant citizenship status to children born to illegal alien parents on U.S. soil. The best way of explaining this perversion is by saying that if a pregnant woman breaks into your home and then delivers her child, does that child assume YOUR last name? No, it retains the name of the parent, and it does not grant that child any privileges. Now if you were to adopt that child, then it would assume your last name. So, basically the 14th Amendment was a declaration that America had adopted the freed slaves and they were now considered, at least legally speaking, on equal footing with the whites who lived in America. I know that is not 100% accurate, but it’s as close a metaphor as I can get to explain the intent of the 14th Amendment. What this did was to bar anyone who had served in the Confederate Army, served in its government, or supported its cause, from serving in any position of authority within the former Confederacy; which was pretty much the entire population of the South. So what happened was that the South was divided up into districts, with each district being governed by a former Union General. It also created the need for those not loyal to the Confederate cause to hold positions of authority within these districts. This was the impetus for the Carpetbagger, an unscrupulous, greedy, or vengeful Northerner who went to the South to take advantage of the defeated Southerners. So not only were the Southerners denied their Constitutionally protected right to a Republican form of government denied by the establishment of these military districts, those who sought to profit off them or rub salt in their wounds flooded southward to fill the vacant positions within local communities. And people wonder why there is still a certain degree of lingering animosity in the South for Yankees?!? So, not only did the South lose the war, their cause dying with Lee’s surrender; not only was their land and infrastructure left in ruins, they also were forced to accept a Constitutional Amendment they disagreed with before they were allowed to resume their rightful place in the Union, and they were governed by people who despised them, or sought to take advantage of them. If, as Adams said, the America Revolution was not the war itself, that the fighting was but a consequence of the Revolution, then we might also say that the Civil War was not just the actual fighting; it was all that led up to it, and all that occurred after the fighting stopped. If that viewpoint is an accurate description of what actually happened, then even after Robert E. Lee laid down his sword and surrendered at Appomattox, the North still was inflicting its will, or fighting if you will, against a defeated people. The South never sought conquest or riches, they only wanted to be left alone in peace and allowed to govern themselves as they saw fit. The North, especially the administration of Abraham Lincoln, refused to allow them that fundamental right, and after the war ended, the North still pillaged and plundered the South; making them suffer for their insolence in thinking they had the right to do what the Founders had done just 84 years prior. But history is written by the victors and the version you have been taught is a decidedly one sided version; with a definite bias towards the North. You’re going to go on believing whatever you want to believe, no matter how much evidence is presented to contradict those beliefs; and that’s your right. But you cannot make the claim that you have never been offered the truth regarding the South, the truth about slavery, and the unjust treatment of the South after the war had ended. The facts are here, and in previous articles I’ve written; you’ve simply chosen to ignore them. And for that, the guilt falls squarely upon your shoulders. I simply go where the facts take me; and the facts prove that the South was just in leaving the Union; for whatever cause. The North, on the other hand, was guilty of an act of war against a peaceful nation; and every horror suffered by the South, both during and after that conflict, is a war crime which should be laid at the feet of the instigator of that horrific conflict; Abraham Lincoln. Yet he has a monument in our nation’s capital which people flock to by the millions. As this is Patriots day; the day which certain States celebrate the beginning of the American Revolution, I felt it only fitting to write in an effort to speak the truth regarding those patriots who lost the Second War for Independence. I don’t know whether I’ve succeeded in getting you to see the truth, but I don’t care; the truth is the truth no matter how many people ignore it.